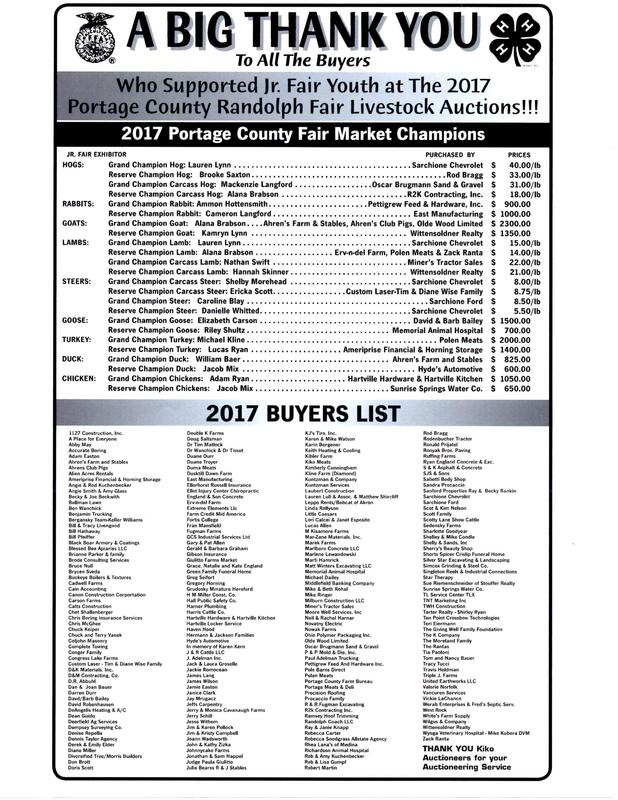 You are cordially invited to participate in this year’s market livestock auctions during the Portage County Randolph Fair. The Junior Fair auctions give you, as an individual or as a business, an opportunity to promote your services and/or support local youth. The youth who bring market animal projects have dedicated their time and energies to care for their project and to also learn about their animal(s). Raising an animal holds many valuable lessons and through these projects they learn about agribusiness, quality assurance, livestock judging, marketing and working together. They also develop a work ethic and will use this knowledge in the future which will make our community better. The youth, who participate in these projects, rely upon the funds received from the auction to pay off investments and production costs and most will invest their profits in their future education. We are lucky to have many past participants return as adults to become advisors, volunteers, mentors, and supporters of the auctions. After the sale, buyers will have their names listed in the barns with the animals they have purchased. Buyers will also be listed in various printed ads after the fair. Buyers will receive a sale day admission pass for the next year’s fair in a special mailing prior to that year’s fair. Send your animal to be processed by one of the local processors. Purchaser pays for processing directly to processor, except poultry and rabbits. ** **All Poultry and Rabbits are processed at one facility and buyers will have the processing fee added to their total bill for the auctions. Poultry and Rabbits will be picked up after the fair on an assigned date that will be available during the auctions. 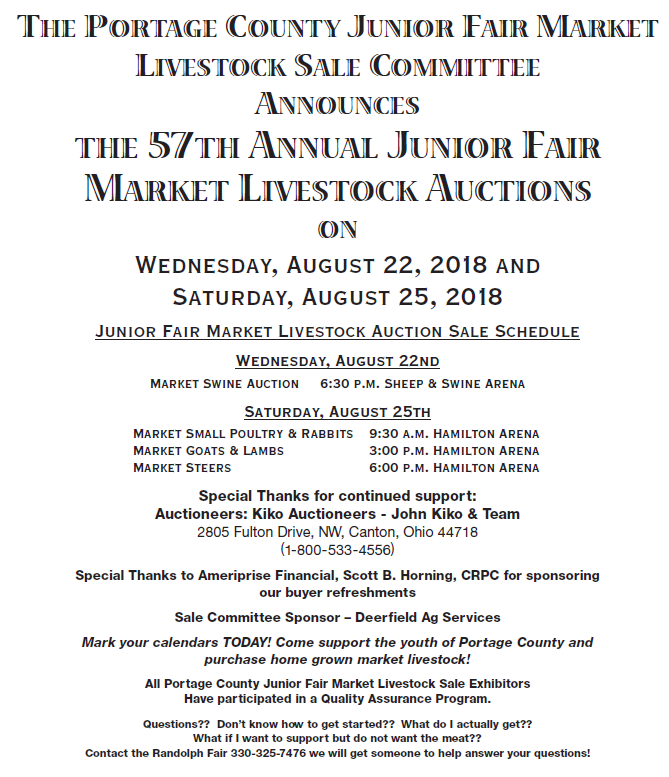 Purchase your hog and/or lamb and FLOOR AS DONATION: your bid price will go to the Jr. Fair member, the meat will go to a local processor who has been approved as the floored buyer and their pre-determined floor price will go to a Jr. Fair fund that you have noted on your buyer registration form. Carcass Champions cannot be floored. Purchase your hog and/or lamb and FLOOR AS ADVERTISING ONLY: If you choose to purchase a hog/lamb for advertising only you will pay the bid price minus the pre-determined floor price. The Jr. Fair member will receive the bid price, but no fund will receive a donation. Must make notation on buyer registration form before auction. Purchase animals (except hogs) and donate them back to be sold a second time. Money from the second sale will to to a Jr Fair fund that you have noted on your buyer registration form. ALL HOGS, RABBITS & POULTRY AND ALL CHAMPIONS ARE TERMINAL. Ewe lambs & doe goats can be purchased and self hauled. Wether goats & lambs can be self hauled, but must be harvested within 45 days of auction. Sale clerk must be notified on sale day so proper paperwork can be completed. You can donate the animal/meat to a local food shelf but, the buyer is still responsible for the processing costs. You must register for a buyer’s ID number at the registration table. Information needed: buyer’s name, address, phone. If a business, we will need the name of business, contact person’s name, business address, phone number and email address. Prospective buyers must also select a meat processor unless purchasing only small animals, donating back, or flooring all purchases. As each animal is sold the auctioneer or ring men will take your bid. Whether or not you are successful in purchasing the animal, your bid will help the sale. When you have finished purchasing, you will need to proceed to the Sale Office and pay for your purchases. You MUST pay for the purchases the day of the sale. Payment can be made with Cash, “Good” check, Visa, Discover or Master Card. There is a 4% buyer’s premium on all sales with a 4% waiver for all payments by cash or check. If any questions, contact Sale Treasurer.